Great win for the Panthers, being four touchdown underdogs. Knocked West Virginia right out the BCS National Championship Game and knocked Ohio State right up into it. 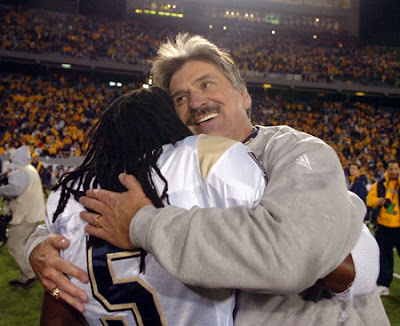 Pitt head coach Dave Wannstedt hugs Kennard Cox after upsetting No. 2 ranked WVU Saturday, Dec. 1, at Mountaineer Field.